Current seventh generation of Golf was introduced in 2012 for Europe, two years after in the US, so some mid-life changes were expected for some time. 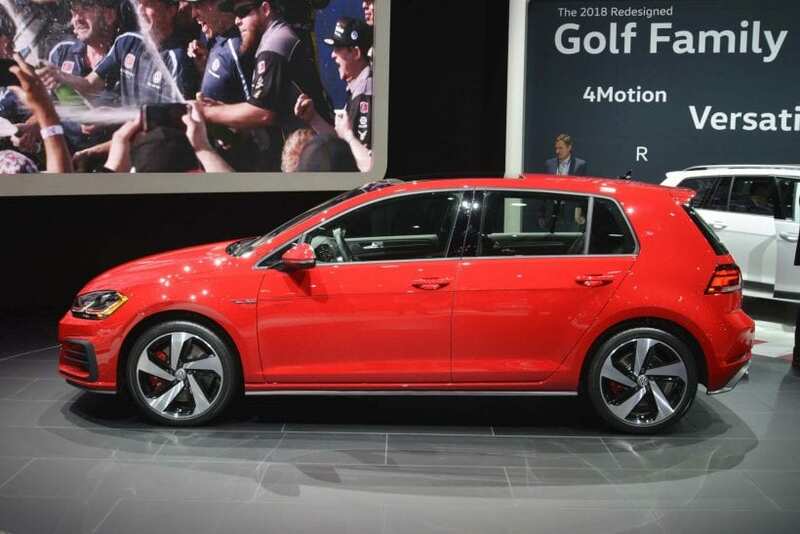 Near the end of the last year Europe saw a refresh of its most beloved hatchback, and finally, same updates found their way across the ocean, and New York Auto Show just hosted 2018 Volkswagen Golf. Despite the fact that this vehicle already exists for five years, changes are in the realm of nip and tuck. Front bumper is revised now featuring horizontal chrome strip among else, same as one above in the grille, headlights kept their shape but feature new layout on the inside, and base model now comes with LED DRL’s. Also, full LED headlights are now an option replacing previous bi-xenon ones. At the rear, the same thing is happening for tail lights, which received LED treatment from the base version, while the bumper is slightly revised, a new diffuser is garnished with some chrome and without visible exhaust tips this time. Everything said applies in the case of estate wagon, while Alltrack model saw same updates apart from the front bumper which remained unchanged, while at the rear we still have double and visible exhaust outlets but now placed in the corners. GTI model received same new lights configuration front and back, with the mildly revised rear bumper, while the hottest one or R model, besides mentioned got new and more aggressive front bumper. That is not all as the rear diffuser received some mesh pattern. Interior saw no visual changes, and we are fine with that since it is most refined one in the class. There are other novelties in fact, as an infotainment system that is upgraded, so in base trim, you’ll start with a 6.5-inch screen instead of 5-inch one before, while the 8-inch unit is still part of higher trims. For some peculiar reason not known to us, new 9.2-inch infotainment system with gesture control remains reserved only for Europe. List of standard equipment is more impressive now as the base model gets rain sensing wipers, GTI start/stop system with automatic transmission, while R starts with Digital Cockpit straight away. For the base model, there are no any changes to the drivetrain as 1.8-liter turbocharged I4 still delivers 170 hp and could be paired with manual or 6-speed automatic, while it takes 7.6 seconds to 60 mph. On the other hand, GTI saw a rise in power by 10 hp, as 2.0-liter turbocharged I4 now pumps out 230 hp while peak torque at 258 lb-ft remains the same, which is the same power offered by Performance version before. 0-60 time is improved by one-tenth, and it is now at 6.4 seconds. You can still opt for 6-speed dual clutch automatic, while higher trim brings limited slip differential also. R model have the power output of 292 hp and 280 lb-ft of torque, from the same 2.0-liter engine, while retaining same acceleration time of 4.9 seconds, but dual clutch automatic has one gear more which makes it seven in total. 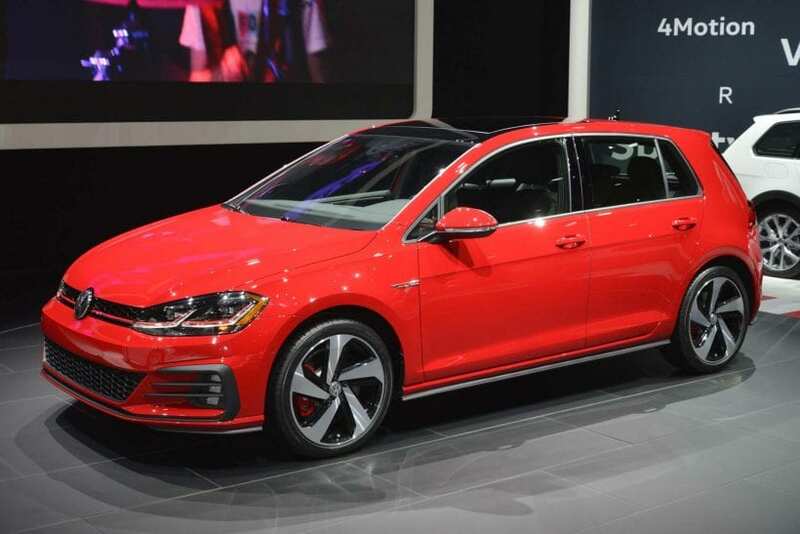 Refresh changed little and although it is on the market for some time, despite the visual lack of excitement with exterior styling and despite the US is denied of the large touch screen controlled by waving, 2018 Volkswagen Golf still remains a top choice if you are in search of refinement within compact class. The base model is still going to start from $20,700, or a couple of grand higher than most competition, but at least you’ll start with better equipment after this refresh. GTI is fairly priced at $25,800 which is in line with Focus ST and two grand less than Subaru WRX, while R starts at $36,500 or pretty much same as Focus RS and WRX STI.